It has been 2 years since I last posted about our dog Kane. I had previously explained how he fought through parvo and how he was as a puppy only months old. Now at 2 1/2 years old we are even more amazed of how he is. The love, loyalty, protection and brilliance of everything he does. I have had 3 Akitas, Labs, and even now have a Border Collie/Australian Shepherd. There are no comparisons. All dogs have good things they may do, but Kane (German Shepherds) are so different. He sleeps outside my bedroom door even though I coax him to sleep in it. He checks on me or my wife then it's like he assumes his role. He does so many amazing things that I could list forever. We feel so lucky that we have him. In fact the last bit I wrote was titled "So lucky.....Our German Shepherd puppy Kane". At that time I knew he was pretty special. He has met my expectations and beyond. If I knew what German Shepherds were like when I was younger I would have never gotten another type of dog. Total German Shepherd: Hey Lanny! 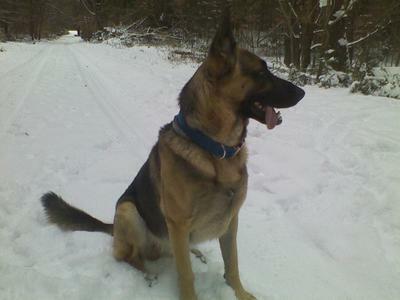 Comments for My German Shepherd Dog, "Kane"
Your little puppy Kane, grew into a Handsome male! German Shepherds are an Amazing breed, they Protect 24 hours, they are Loyal, Intelligent but of all this they are Loving. Thank God he made thru Parvo, he is big, strong and looks so Healthy!!! Take care of your boy Kane and he will Always take care of you!!! So great that he is do well! They are a special breed! Keep posting.